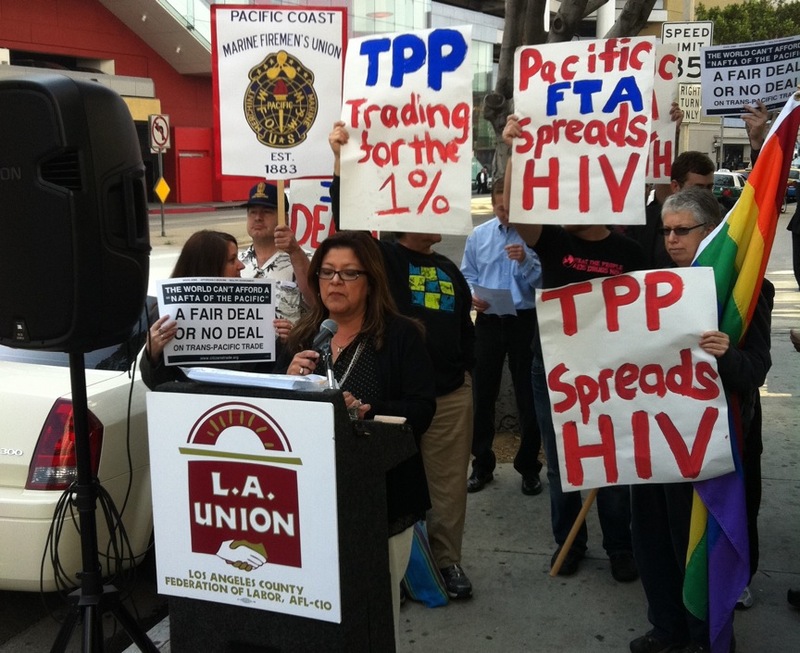 Last week's rally for a fair deal or no deal in Los Angeles! Wow, that’s big, right? So why haven’t we heard more about it? Trade negotiators, including leadership from the United States and the other nine countries involved have been meeting secretly. And while those who will be impacted by such a trade agreement are left out of these conversations, around 600 certified corporate advisors (read: corporate lobbyists and corporate lawyers certified by the United States to have input on these agreements) have had full access and influence in the TPP negotiation process. - Outsourcing of jobs & decreasing worker protections: much like NAFTA, TPP will strip away labor protection laws and promote companies to outsource even more jobs from the U.S to poorer countries signing into the agreement. This means very low wages, no contracts or insurance, and hazardous working conditions, a maddening level of exploitation leading to situations like this one. - Decreased access to medications such those needed by people living with HIV/AIDS: through TPP, large American pharmaceutical companies are looking to impose intellectual property laws that would ban the production and sale of generic medications, including lifesaving HIV medications. This means higher corporate profits at the expense of the health and lives of poor and working people, locally, but particularly in countries such as Viet Nam where patented medicine prices are 46 times higher than international averages. - Increasing corporate control: TPP would give corporations the right to sue countries involved in the agreement. For example, when a government bans a hazardous chemical used by a company, which, in effect hurts the accumulation of profit by that company, that company can sue the country for billions of dollars. What’s worse is that the outcomes of these cases are decided on by non-democratically elected tribunals, often made up of people with corporate interests. - The destruction of nations’ health and sovereignty: much like NAFTA, TPP trades away the land, energy, food, materials, and labor of the nations’ involved for corporate control and prioritizes profit. Furthermore, free trade agreements put public services and natural resources like water up for sale, leading to their privatization and threatens people’s access to them. Last week, organizers in Los Angeles and San Diego, two locations where trade negotiators were set to meet in secrecy, held rallies and protests to raise awareness about the detrimental impact of a free trade agreement as egregious as TPP. I write this in hopes of raising awareness and agitating people into remembering that this world and its resources are for all of its people, not profit. Furthermore, speaking from the position of someone living in the United States, where most of our food and products are produced cheaply due to trade agreements like this one, it is necessary to be reminded that to me, my strong family means that we are part of a system that gives as it receives, with gratitude. Our livelihood is not dependent on the exploitation of others. For more information you can visit citizenstrade.org for up to date info or contact tim@citizenstrade.org, who is organizing the work being done around TPP happening in California. You can also support by “liking” California Fair Trade Coalition on facebook.